Window treatments are the perfect finishing touches for your home. Without window treatments, it can be clear that something is missing from your space, making it feel incomplete. However, it can be difficult to find window treatments for your specialty-shaped windows. Oftentimes, you have to sacrifice being able to customize your window treatments or even adding a window treatment to your home at all, if you have a specialty-shaped window. Lucky for you, Hunter Douglas has created some great solutions for specialty-shaped home windows. These products hold the standard for Hunter Douglas products, meaning that you won’t have to compromise your customization options and still have a high-quality window treatment for your specialty-shaped windows. There are three main categories that specialty-shaped windows seem to fall under. The first of the categories is circular window treatments, which includes angular and arched windows. Windows that fall under this category typically are integrated into a home to add elegance or a more dramatic effect to a home, making it necessary to also incorporate a window treatment to enhance those effects. However beautiful this window style may be in your home, it can be difficult to treat with a blind or shade because you want the treatment to be stylish while still providing the basics like privacy, insulation, and light control. Similarly, there are about nine different types of arched window styles, including Gothic and stationary, that require customization for each window. Hunter Douglas has 13 different styles of window treatment that can work for arched windows, ranging from the EverWood® Alternative Wood Blinds to the Somner® Custom Vertical Blinds. The other two categories for specialty shaped windows include corner, bow, and bay windows and French doors. Although some may not consider French doors to be an element of your home that requires a window treatment, styling your French doors with a window treatment can transform your space. Similarly, you could be losing heating and cooling through the windows on your French doors, costing you money. 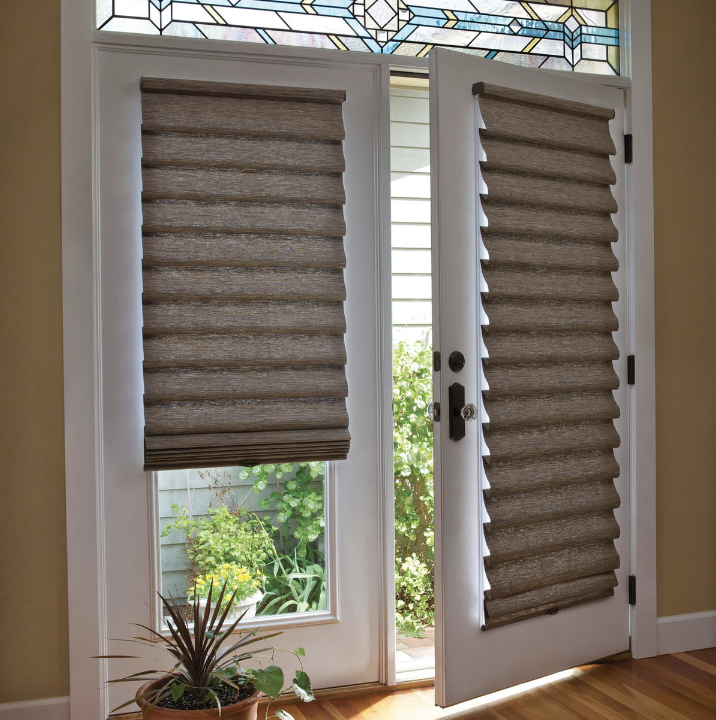 There are certain window treatments work best with French doors, such as shutters from Hunter Douglas that make it easy to access the handle to the doors themselves. You want your window treatment to enhance your window rather than impede its functionality. Bay windows can also be difficult to style despite their ability to add depth and dimension to an otherwise flat area of your home. Although many people incorporate a bay window into their space to bring in more light, you still want the ability to be able to control the amount of light that enters your home and add some extra privacy. By adding a window treatment to the bay, corner and bow windows in your home, you will be able to control how much light floods your space and be able to make that area of your home more private. It can be somewhat overwhelming to try and sort through all of the options available for your specialty-shaped windows, but you don’t have to make this decision alone. Come see us at Rockland Window Coverings where we will work with you to find the perfect window treatment for your home in Saddle River, New Jersey. We are located in Spring Valley, New York and we serve the surrounding areas, including Pomona, New York and Saddle River, New Jersey.